We dubbed our Class A RV "Windwaker" for two reasons. 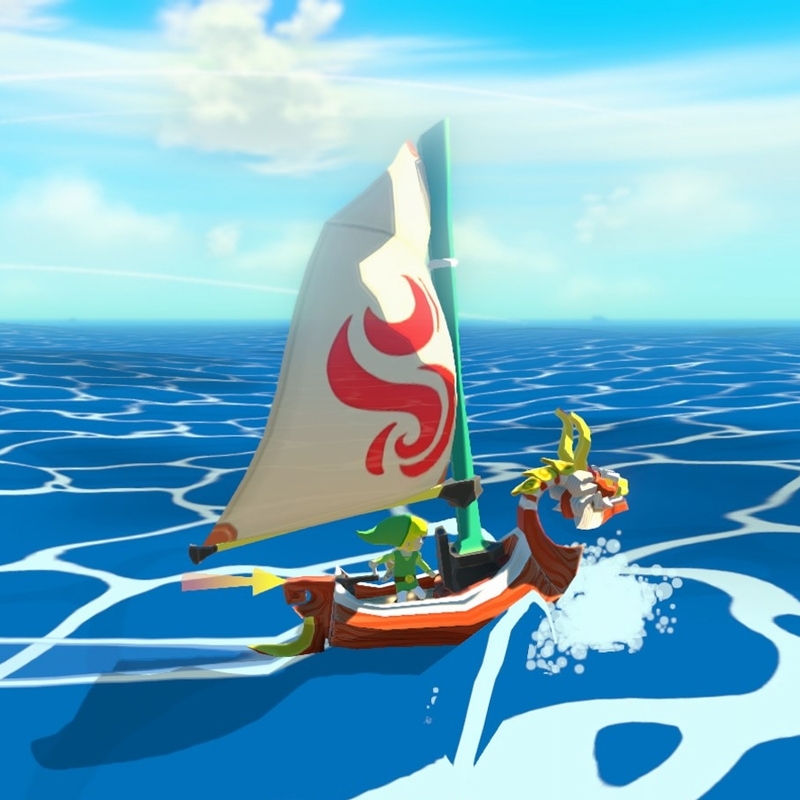 First, it's a geeky reference to one of our favorite games, The Legend of Zelda: The Wind Waker, about a young hero who must sail the seas to defeat an evil king. Second, because riding in it felt exactly like we were on a boat. And not in a good way. After experiencing the smooth ride of our dual-rear-wheel Ford F-350, we were in for a surprise when we took our first drive in Windwaker. We wobbled around every corner, swayed from side to side, and a stiff breeze could just about push us off the road. But we assumed that this was normal for Class As, and we went on with our lives. We drove from Denver to Houston, and then west as far as Yuma before we were fed up with being totally exhausted at the end of each driving day. So we decided to make a change. After doing a bunch of research and calling around to a bunch of repair shops, we made an appointment at Redlands Truck & RV in Redlands, California. Not only did our steering wheel think that two-o'clock was straight, we had to fight to keep it there. If we let go, even with one hand, and even just for a second, we'd start veering out of our lane. If you want to know what makes for a grumpy RVer, it's not being able to take so much as a sip of caffeinated soda while putting in a 300-mile day. This is where the "I feel like I'm on a boat" sensation came into play. Every time we'd go over an uneven lane or turn a corner over a dip in the road, we'd start swaying side to side. We never felt like we were going to tip over, but it was still scary, and definitely a recipe for driver exhaustion. Whenever the wind got really gusty, we'd struggle to stay in our lane. Even more commonly, every time a big truck approached us on the left, we'd be jostled roughly to the right; as it went on by, we'd be sucked back to the left. Mix that in with the steering issues, and that made for some white-knuckle nonsense right there. The bad news is that we drove this way for four months before we realized it was optional. The good news is that we found a wonderful shop that truly made a huge difference in the driving experience of our Class A. Now that we've experienced the before and after, we believe that trac bars should be mandatory for all Class A gas RVs, right out of the box. These essential add-ons generate stability for the chassis, keeping it from wobbling back and forth when wind pushes you and trucks pass. Redlands installed a Roadmaster front trac bar and a SuperSteer rear trac bar on our rig, and the difference is amazing. It's not as if there is no shaking now, but it is dramatically reduced. This is probably the single biggest improvement to the driving performance of the rig. These come in different sizes, so if you're ordering parts yourself, make sure you talk with a sales rep about your RV's specs first. Also, if you just have the cash for one, installing the rear one will make a bigger difference than the front. 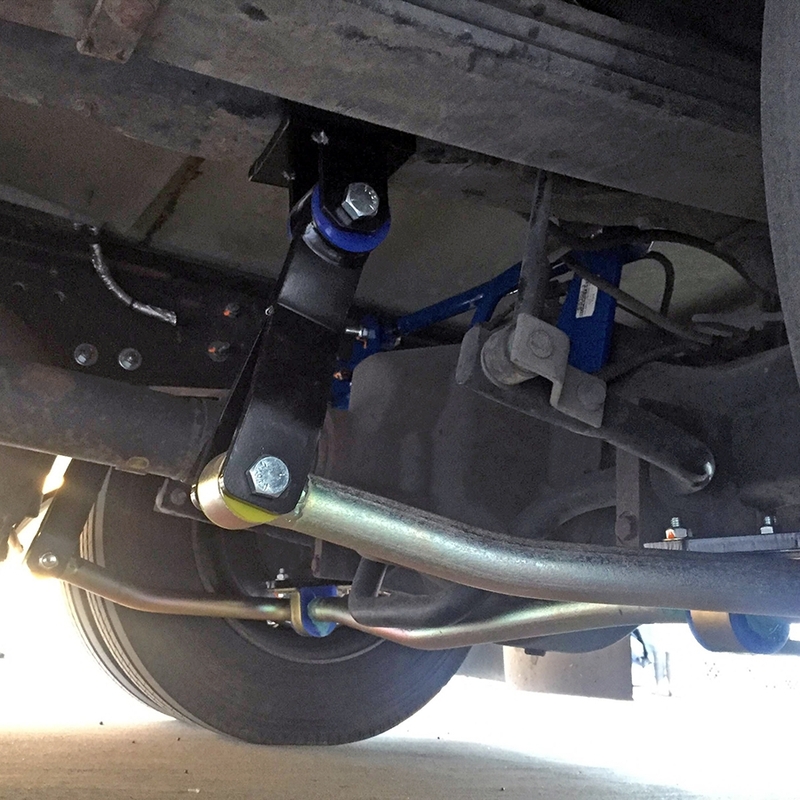 The installation of front and rear sway bars has made significant strides towards eliminating our body roll issue. We purchased our front and rear anti-sway bars directly from Roadmaster, whose staff were able to point us to the specific model numbers we'd need for our RV. We highly recommend speaking with a rep directly to make sure you're ordering the right part for your rig. We brought our sway bars to the shop, where they were installed for us. 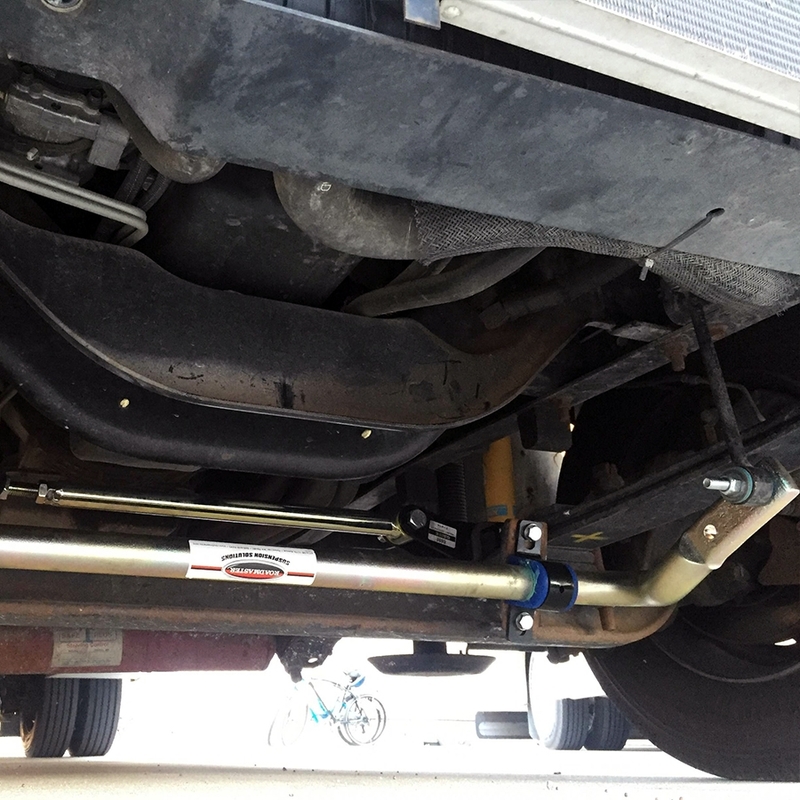 Front sway bars are easier to install than rear ones, meaning that if you're looking to save some cash, you might consider attempting that one yourself. Turns out we already had a Safe-T-Plus steering stabilizer, and it was doing its job: returning the wheel to center and helping the driver control the steering. But since our RV was out of alignment, we just ended up fighting the stabilizer. The Safe-T-Plus comes in different sizes, so it's important to know which one will fit your RV before you place your order. In addition, you'll need a bracket kit and hardware, sold separately, to complete the installation. We knew we desperately needed an alignment to tie together all of the other stabilization add-ons and get the steering wheel as close to center as possible. But when we were quoted over $400 for our alignment, we nearly choked. We'd been expecting something in the $100 range, tops. So we grilled the folks at Redlands, wondering what on earth made it so expensive. Most auto repair shops aren't able to handle an alignment for a chassis as long as an RV's, so RV owners typically go with a truck alignment. These usually cost under $200, and this is an acceptable way to go. Then there are 4-wheel alignments like the one Redlands offers, which use lasers for precision, aligning not just the front and rear axles, but also the thrust angle alignment (front to rear). Especially a problem in RVs with a longer wheelbase like ours, alignment issues can cause uneven wear on tires, even worse mileage, and poor steering and handling. 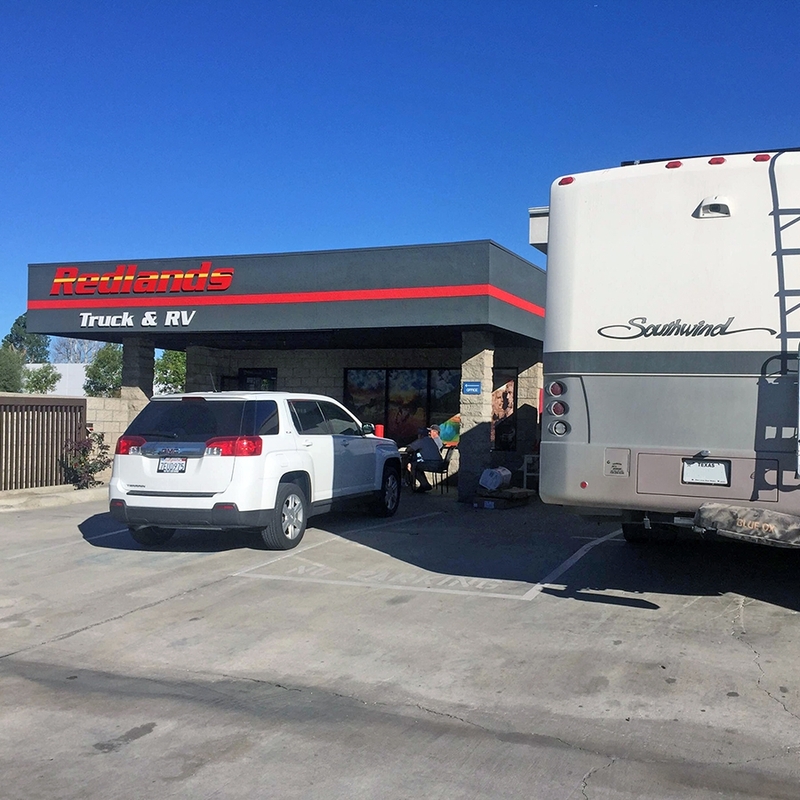 In addition to their sci-fi-sounding laser alignment, Redlands provided us with a weighing service as thorough as the Escapees' SmartWeigh, which is essential for ensuring proper weight distribution and tire pressure—especially if you are new to your RV. They also inspected the camber and installed new caster wedges; even a slight misalignment here can make a big difference over the length of a coach. Finally, they got the steering wheel as straight as it would go. We're happy to report that everything is precision-perfect now. When we bought Windwaker, her tires were aired up to the maximum number on the tire wall. As a result, our ride was super rough. We lowered the pressure some on our own, but after our alignment and official weighing, Redlands brought our pressure down even more to the appopriate level, based on the inflation tables by the manufacturer. Follow these links for tables published by Michelin and Goodyear. 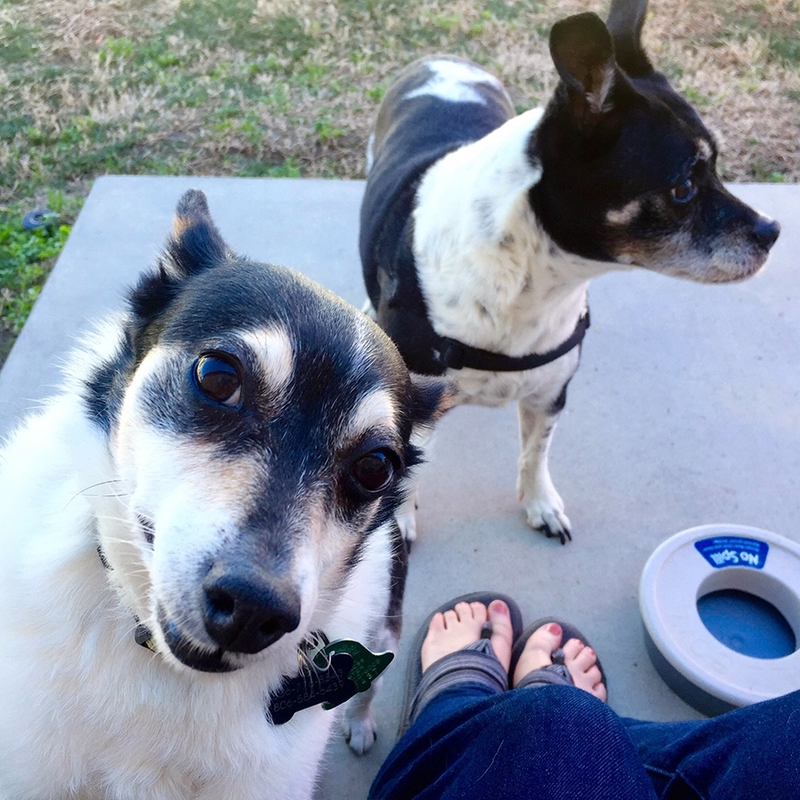 This adjustment has made a huge improvement in our ride, and it will extend the life of our RV, as everything isn't being jostled around quite so much. Several service shops recommended we invest in Koni hydraulic shocks that give gas Class As a "diesel-like ride." We considered this, but it would have added thousands to our bill, and our Bilstein shocks were still in good shape, so we decided to wait until our current shocks are going out. Here's a breakdown of the prices for these upgrades. We have listed our costs below (except for the Roadmaster sway bars, which we were able to secure at a discount through some friends). You should expect to pay as much as $5,000 for these add-ons, depending on the deals you find and how much of the labor you are willing to pay someone else for. We loved our time with Redlands Truck & RV. 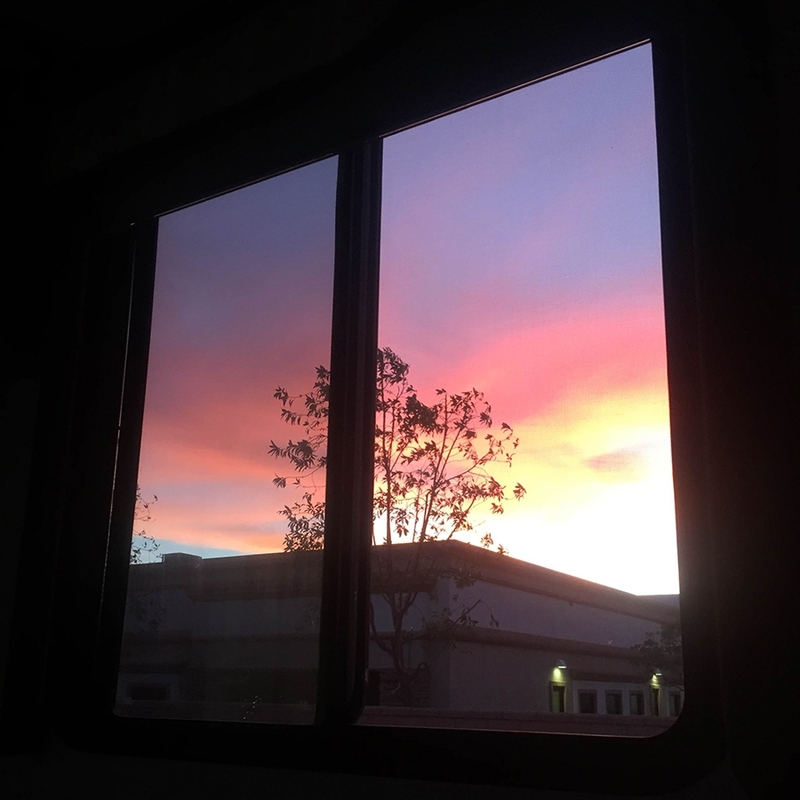 We can honestly say that our experience there was the best we have had at an RV repair shop in our 1.5 years of full-timing. Redlands, itself, is convenient to I-10 and yet isn't plagued by too much bad traffic. In addition, it has tons of shopping and a super-cute historic district, so you can find whatever you need here. In summary, no, this was definitely not free. And after investing in a solar system, it stung a bit. But considering we paid a lot less for our gas RV than we would've for an equivalent diesel, and the driving experience is now several steps closer in that direction, we feel the expense was definitely worth it. Plus, we are reassured that we are now much safer as we barrel down the road. If nothing else, now we can stop sprouting gray hairs on driving days! Have you made any changes to your RV's stabilization? Has it made a difference in the way it handles? Remember, you will need to order the appropriately-sized parts for YOUR RV. Do your research before purchasing.